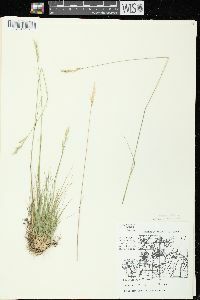 Danthonia spicata (L.) P. Beauv. ex Roem. & Schult. 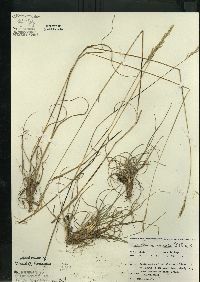 Culms (7)10-70(100) cm, disarticulating at the nodes when mature. Sheaths pilose or glabrous; blades 6-15(20) cm long, 0.8-3(4) mm wide, usually becoming curled at maturity, glabrous or pilose, uppermost cauline blades erect to ascending. 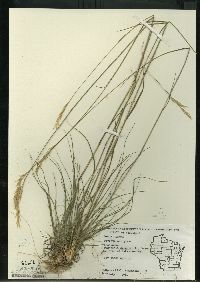 Inflorescences with 5-10(18) spikelets; branches stiff, appressed to strongly ascending after anthesis; lower branches with 1-3 spikelets; pedicels on the lowest branch from shorter than to equaling the spikelets. 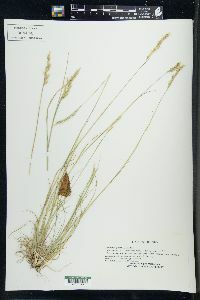 Spikelets 7-15 mm. Calluses of middle florets about as long as wide, convex abaxially; lemma bodies 2.5-5 mm, usually pilose (sometimes glabrous) over the back, margins pilose to about midlength, longest hairs 0.5-2 mm, apical teeth 0.5-2 mm, acute to aristate, less than 2/3 as long as the lemma bodies; awns 5-8 mm; anthers to 2.5 mm. Caryopses 1.5-2(2.3) mm long, 0.7-1 mm wide. 2n = 31, 36. 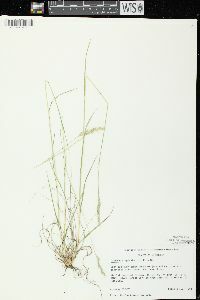 Danthonia spicata grows in dry rocky, sandy, or mineral soils, generally in open sunny places. Its range includes most of boreal and temperate North America and extends south into northeastern Mexico. 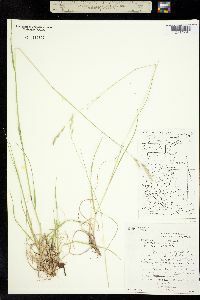 Phenotypically, Danthonia spicata is quite variable, expressing different growth forms under different conditions (Dore and McNeill 1980; Darbyshire and Cayouette 1989). Slow clonal growth, extensive cleistogamy, and limited dispersal contribute to the establishment of morphologically uniform populations, some of which have been given scientific names. 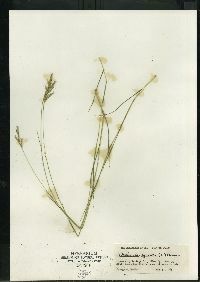 For instance, D. spicata var. 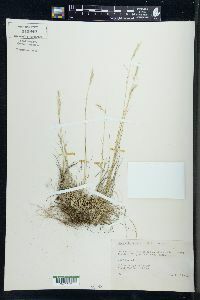 pinetorum Piper is sometimes applied to depauperate plants and D allenii Austin misapplied to more robust or second growth plants (Dore and McNeill 1980). Plants of shady or moist habitats often lack the distinctive curled or twisted blades usually found on plants growing in open habits. 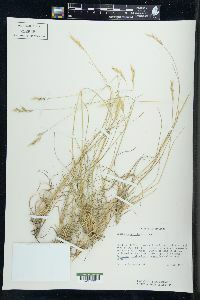 Such plants, which tend to have smaller spikelets and pilose foliage, have been called D. spicata var. longipila Scribn. & Merr. The terminal inflorescence is usually primarily cleistogamous, but plants with chasmogamous inflorescences are found throughout the range of the species. Chasmogamous plants differ in having divergent inflorescence branches at anthesis, larger anthers, and well-developed lodicules. Perennial tufted herb 7 cm - 1.05 m tall Leaves: with open, soft-hairy or hairless sheaths having tufts of hairs at the blade-sheath junction, and ligules made of hairs. The blades are 6 - 20 cm long, 0.8 - 4 mm wide, usually curled when mature, and hairless or soft-haired. Inflorescence: terminal, branched. 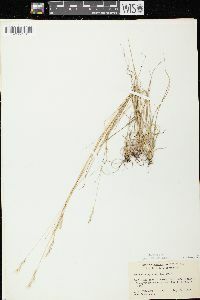 The branches are stiff, appressed to ascending after flowering, with the lowest branches bearing one to three spikelets. Fruit: a brown caryopsis, 1.5 - 5.5 mm long, egg-shaped to inverse egg-shaped, flattened on back, with a linear scar. 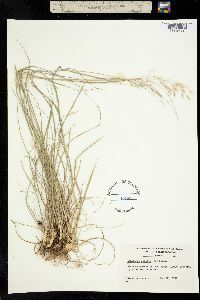 Culm: erect, 7 cm - 1 m long. 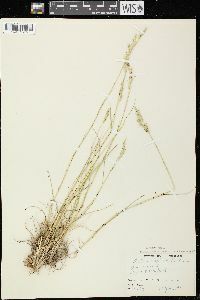 Spikelets: five to eighteen per inflorescence, 7 - 15 mm long. 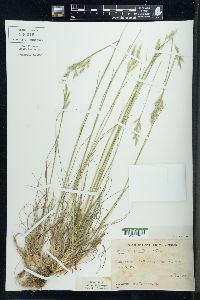 Glumes: nearly equal, lance-shaped, thin but firm (chartaceous), longitudinally ridged. 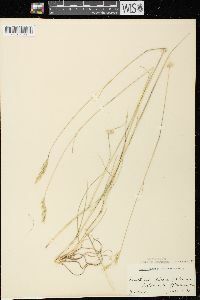 Florets: three to twelve per spikelet, with three anthers up to 2.5 mm long. 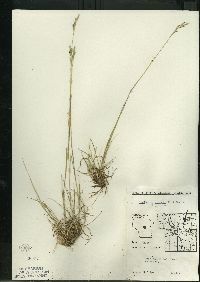 The terminal floret of each spikelet is rudimentary. Lemma: 2.5 - 5 mm long, terminating in two pointed lobes and a bent awn 5 - 8 mm long, usually soft-haired but occasionally hairless on the back. 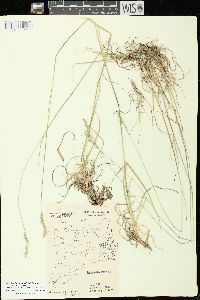 The margins are hairy on the bottom half and toothed near the tip. Palea: about as long as the lemma (without the awn), with a blunt tip and two rough veins. Habitat and ecology: This species grows in poor soils, old worn clay pastures, abandonded sandy fields, and sandy black oak savannas. Etymology: Danthonia is named after the 19th century French botanist Etienne Danthoine. Spicata means spiked. Infrequent to common in all parts of the state. It is common in poor soil in open woods on the crests of ridges in southern Indiana, becoming less frequent to rare in the rich, neutral soils of the central part of the state, and again appearing as frequent on black and white oak ridges of the northern counties. It is found also in post oak flats. 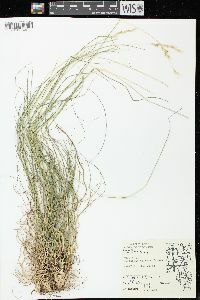 Densely tufted, 2-6 dm; lvs borne mostly at or near the base, with a prominent tuft of white hairs at each side of the summit of the sheath, the blades curly, usually involute, seldom over 12 cm, 1-2 mm wide; lower sheaths often containing cleistogamous spikelets; infl contracted, racemiform, 2-5 cm, the short branches rarely with more than one spikelet; glumes 8.5-13 mm; lemmas broadly ovate, sparsely pilose on the back, 3.4-5.2 mm, including the triangular-acuminate teeth 0.8-1.8 mm; awn 4.5-7 mm; often apomictic, with abortive anthers; 2n=36. Dry woods in sandy or stony soil; Nf. to Fla., w. to B.C. and N.M.